So the function of the first If Then statement is to append my default signature to the end of the email. However, when this code is run, the signature that is appended looks to be HTML code instead of the signature …... Looking to add an E-mail Signature to all outgoing messages? 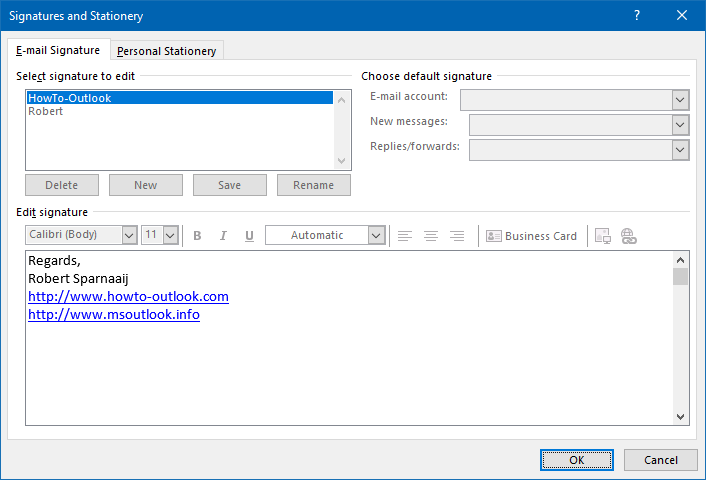 The following article will show you how to add an e-mail signature using the new Outlook Web App for Exchange 2010. Outlook app DOES support HTML signature but can only have one signature in HTML. After you paste in HTML code if you go back in to edit it, or add a second signature, it destroys the first one. After you paste in HTML code if you go back in to edit it, or add a second signature…... It looks like when we do this from inside the Outlook Web App, any base 64 format images in the signature are dropped when we set the email’s body using the setAsync() method. Looking at the email body html, I see that the element still exists in the email, but it has no src attribute anymore. It looks like when we do this from inside the Outlook Web App, any base 64 format images in the signature are dropped when we set the email’s body using the setAsync() method. Looking at the email body html, I see that the element still exists in the email, but it has no src attribute anymore.